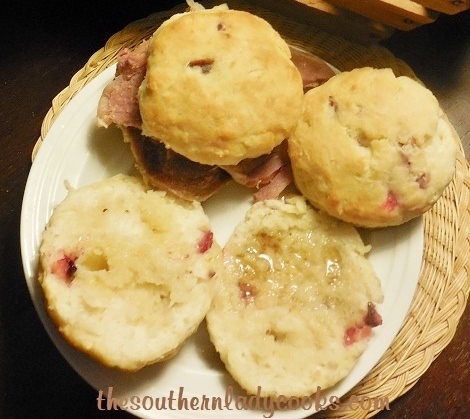 A buttermilk biscuit is a Southern treat. We Southerners love biscuits and buttermilk biscuits are a tradition! We like them for breakfast, dinner, and supper. All good Southern cooks know how to make biscuits. Give me a buttermilk biscuit with honey or blackberry jam and I am a happy camper. There is nothing like a buttermilk biscuit! Cut the shortening into the flour. Add the rest of the ingredients and enough buttermilk until flour sticks together in bowl. Turn out onto a lightly floured surface adding more flour if dough is too moist and roll out to about 1/4 to 1/2 inch thick. Cut out biscuits with cutter and place on a baking sheet that has been sprayed. Cook about 8 to 10 minutes until golden brown at 450 degrees. Makes about 15 to 20 biscuits depending on the size of your cutter. Serve with lots of butter, honey, sorghum, or your favorite jams and jellies. Click to follow us on Instagram. Don’t forget to pin buttermilk biscuits. © The Southern Lady Cooks photos and text – All rights reserved. No copying, posting on other sites, or other uses allowed without written permission of the copyright holder. Feel free to share by clicking on the Facebook, Twitter or Pinterest icons below. You can print by clicking on the green printer icon above and below every post on this site. Be sure to look on the right hand side of any page and type in your email address to receive our free newsletter. Your email will not be shared with anyone and you will receive new recipes, tips, etc. right to your inbox. Join 20,000 happy subscribers today. I followed directions to a tee, but my biscuits did not raise. I bake all the time, and never have had this happen. Any suggestions? It can be a number of things Terri. Your baking soda or baking powder could have lost strength, you could have not cut the biscuits thick enough, oven temperature could be a bit off, biscuits placed close together or touching rise higher, even the humidity. Hi Southern Lady. This is Terri. I followed your suggestions and made my dough thicker and close together on my baking dish. They turned out great. Thanks. So happy they worked for you. Thank you for letting me know and have a great week. Good Morning!! Can I use real butter in place of the shortening?? Yes, that should work Robert. I made theses Biscuits this morning they was very good, will made them again……….. So glad you enjoyed the biscuits Betty! When i make biscuits I follow your recipe to a T. Mine always taste great and they are always tender and flaky. My only wish is the tops of my baked biscuits look as nice as yours. I made this for our breakfast, plus scrambled eggs. My husband almost swooned. I was especially delighted to try your buttermilk biscuits. I have been making biscuits since I was just a girl, and this “girl” will be 72 in a few days, but this recipe is a keeper. I was out of shortening, so I pulled out a container of lard I bought some time ago to try. The biscuits were high, light, feathery, and were all-around delicious. Thank you! It just may be my new go-to biscuit recipe! So glad you are enjoying the recipe! Can you tell me the difference between supper and dinner? Hi Carol, When I was growing up in the South most people called “lunch” dinner and it was served as your noontime meal and then you had supper as the last meal of the day. Now, most people call the last meal of the day “dinner”. It used to be when I was young we had breakfast, dinner and supper. Now, we mostly have breakfast, lunch and dinner. I hope this helps.Really it is just the same thing. These Biscuits look exactly like the ones my Mother used to make when I was growing up in West Virginia. They were the best. I am going to make some too. Ms. Judy–Got your “Sweet Things” cook book. Love it. Can you freeze buttermilk and thaw out later for baking?? We don’t drink it but love to use it in baking. Seems like we waste a lot of it. Thanks in advance for your help. Yes, I think you could do that but you can also make your own for use in recipes with regular milk. Check here for a list of Handy Food Tips. How to make your own buttermilk for recipes is posted in the list.https://thesouthernladycooks.com/handy-food-tips/ There is also a powdered buttermilk you can buy in the grocery. I am happy you like the cookbook and hope you enjoy it for many years to come. Thank you for your purchase. Thank you so very much… Have a wonderful Thanksgiving..
You have a wonderful Thanksgiving, too, Robert. Happy you like the cookbook and happy to have you on my site. My question is, does it change anything in the quality of the biscuit to use Bread Flour instead to AP Flour? I cannot answer that because I only use all purpose flour, Bob. I don’t think it would though. What brand of flour do you use? God Medal most of the time. Could you freeze these after they are cut out and only cook as many as you want at a time? Yes, you could Jackie. I have frozen them before. Can you use lard instead of shortening? Hi I am new to cooking and this recipe looks yummy my question is your recipe calls for 1/4 cup shortening is that Crisco that comes in a can or are is it cold butter sticks from the fridge? Yes, shortening comes in a can. Going to try this recipe today!! Although I’m southern, my momis from up north so this is one thing she did not teach me!! Gonna teach my daughters too!! Mm mm GOOD!!! By the way, do these freeze well baked or before? You can do them both ways, Felicia. Buttermilk biscuits will make a grown man cry they’re so good ! You’re absolutely right. I even won a 4-H County Bread Baking Contest in when I was in the 5th grade! That was Biscuits and Cornbread Muffins. Most true southern girls start cooking very early in life…I remember starting supper while my Mother was on her way home from work when I was 8 years old. I still think these “biscuits” are what we in UK call scones… I remember my mother making these back in the day when scone making was a skill on the same level as making sponge cakes…. I thought the same, always wondered what they were. They are not scones. Completely different. I don’t like sugar in my biscuits so could I just leave that out or would I have to replace it with something else? I just found yr recipes. Haven’t tried anything yet. Actually i haven’t cooked for a long time. What can i use instead of shortening. It can’t be bought where i live. I think you could use butter, Judy. I am making beef stew for dinner tonight. Your biscuits will go great!! Thank you..
Hi from Australia – We call these Scones. I normally eat them warm with strawberry jam & fresh whipped cream. Normally eaten as morning or afternoon tea instead of cake. As a child, I would eat them with mashed sardines & sliced beetroot instead of sandwiches for lunch also lightly fried with bacon and eggs for breakfast. More ingredients to your recipe, so I am going to try it. What is Baking Soda ? It’s like baking powder. It causes the biscuits to rise. This explains how to use each in cooking. Grocery stores sell it in the baking goods section. I just found Southern Lady and love her recipes. Is high tea still at 4? My family was from Englefield Green. My great grandmother didn’t care what I did as long as I joined her for high tea! My cousins lived in Staines, Middlesex. Baking soda is called Bicarb of soda in the UK and Australia. I remember when my sister (from Mississippi) told me that she was having biscuts with sausage gravy for breakfast one morning. I thought she was absolutely crazy (I’m from the Midwest) until I went for a visit and tried them ! My favorite thing to eat !!! Great recipe…great blog ! Thank you so much Pam. Love biscuits and gravy. I see this is an old question/answer, but I’d like to know what people in the midwest eat for breakfast! I’m from Missouri and home made buttermilk biscuits and milk gravy is a tradition that is going away. The younger generation is buying the instant gravy and biscuit mix. I learned a long time ago how to make gravy but did not want to know anything about the biscuits. Too messy I thought. My mother in law was excellent at it. I always thought she would always make them. I didn’t think about her passing away. I just recently made my first batch after a lot of research and they turned out like hers. I was thrilled! I am going to make sure my daughters and granddaughters know how to make them. I learned that getting your flour, butter and buttermilk very cold is a key thing to do and don’t knead the dough to much. Maybe only 4-5 times. The more you handle it the tougher it gets. When you cut your biscuits out don’t twist, just cut straight down. Adding bacon drippings to your pan your baking in also adds a very good country flavor. These Country Fried Potatoes are good. I’m Canadian and my mom used to make them all the time. Sometimes I make just these as a quick supper. Yum. Hi, darlin’! I am so happy that I found your site. There are some things that my grandma would make for me during my summer visits in Florida that I couldn’t remember how to make. Your site brought those Southern memories back. Thanks! Thank you Southern Ladys for such wonderful recipes, I have tried many of them and they were the absolute bomb with my family. Do you have some hot dog sauce/chile recipes that are your favorite?. I’m looking for something new to try. As a scotsman married to an American lady I was introduced to American buscuits about 10 years ago. when I asked my good lady wife for some buscuits recently she told me she had lost her recipie- now thanks to your wonderful blog I may get some for my breakfast come the weekend. My mouth waters just looking at this picture. These are the best biscuits in the world! I could eat them every day!